Today a trip to the Mukilteo Lighthouse park in Mukilteo, Washington gave us the chance to see some beautiful scenery, the Whidbey Island Ferry, and to meet a nice young man with a couple of very nice fish. 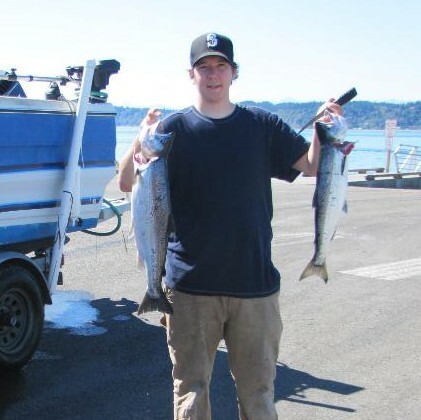 Austin Edmison was kind enough to show us the two silver salmon that he had just caught. He had just pulled his boat out of the water and had begun to clean the fish. He explained to me that the name silver salmon is a local term for coho salmon, the real name for the fish. Austin said his catches today weighed in about nine and six pounds. He also shared the news that he is the proud father of an eight week old baby girl! Congratulations to Austin and his family. Meeting nice people like Austin make our journeys and adventures worth every minute.